The official Xiaomi PC Suite for Windows PC latest version for the user of Xiaomi smartphones for connecting there Xiaomi with there PC of exchanging data between PC and smartphone. The latest version of Xiaomi PC Suite for Xiaomi has the support of the latest Xiaomi smartphones and other devices you can use this for updating your Xiaomi devices with the latest version from it,s official firmware support area. Xiaomi PC Suite software is a free Windows PC based application for Xiaomi users to manage all of there data like pictures, videos, emails, contests and other data with there PC or transfer from PC to smartphone. Xiaomi PC suite has the full support of all over the Xiaomi smartphones latest and old from Xiaomi here we share some of them which are tested by me. Redmi Note 5A,Mi 5X,Mi Max 2,Mi 6 Plus,Mi 6,Redmi 4X,Mi 5c,Redmi Note 4X,Redmi Note 5,Redmi 5 Plus,Redmi 5,Redmi Y1,Redmi Y1 Lite,Redmi 5A,Mi Note 3,Mi MIX 2 Special Edition,Mi MIX 2,Mi A1,Redmi 4A,Redmi 4 Prime,Redmi 4,Redmi Note 4,Redmi 3S Prime,Redmi Pro,Mi Max Prime,Redmi 3X,Redmi 3S,Mi Max,Mi 5,Mi 4S,Mi MIX,Mi Note 2,Mi 5s Plus,Mi 5s,Redmi 3S Plus,Redmi 3,Redmi Note Prime,Redmi Note 3,Mi 4c,Redmi Note 2,Redmi Note 2 Prime,Redmi 2 Prime,Mi 4i,Redmi Note,Mi 3,Hongmi Red Rice,MI2A,MI2S,MI 1s,MI 2,Redmi 2A,Mi Note Natural Bamboo Edition,Mi Note Pro,Mi Note,Redmi 2,Redmi Note 4G,Mi 4,Redmi 1S. Auto-Install all the USB and abd drivers of your smartphone you don't need to search USB drivers for your device on the web. Share your PC internet to your smartphone. Auto search your smartphone latest update from its official mirror and update your device with the latest Android OS. 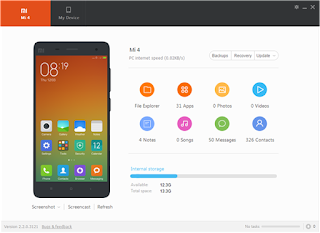 You can install apps from your PC to your Xiaomi smartphone using app manager. You can backup or restore your contacts and SMS using that app. Xiaomi PC Suite latest version has the full support of all type of Windows OS 32bit and 64-bit 7,8,8.1, 10 but you must have to MS Net firmware 2.5 or higher on your PC then it will work well.